Experiencing a fire in your home or business can leave you feeling overwhelmed, stressed out and unsure of what to do next. ICC will take immediate steps to start getting life back to normal and will be there for you at every step. 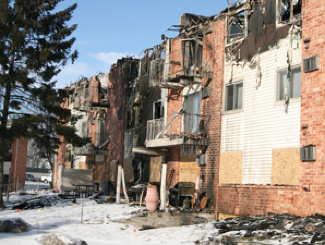 From initial board-up to the last detail, ICC handles losses caused by fire from start to finish through one point of contact. Because we offer the widest range of services we have the skills, equipment and experience necessary to handle every aspect of the loss. 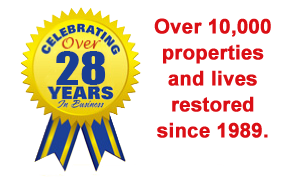 Our focus on mitigation means we’ll do everything we can to restore your property back to pre-loss condition without reconstruction or replacement in order to get the job done faster. Our full service capability means that if reconstruction services are needed, ICC will take care of the entire process. Damage assessment and creation of a restoration action plan, with expert project management to ensure on-time completion. Restorative cleaning using a variety of highly specialized techniques to remove soot and smoke odor. Expert content management with complete inventory cataloging and storage of personal property in our safe, secure and climate-controlled facility. Contents restoration that not only speeds time to completion, but also saves items of sentimental value that others discard without even trying to restore. All necessary restoration and reconstruction services provided through a single point of contact. An IICRC certified technician on every loss, with all work done to the proper Standard of Care.